Teqava Sparkling Tequila Cocktail presents “Last Comic Standing” winner, Felipe Esparza at the Joke Joint Comedy Showcase. ONE NIGHT ONLY, three shows – 6pm, 8pm and 10pm. 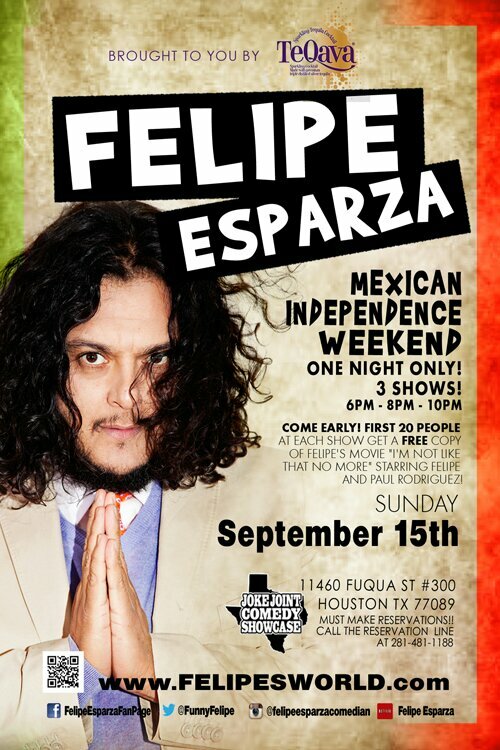 Fresh off the heels of his Last Comic Standing win and his 1 hour Showtime special, “They’re Not Gonna Laugh at You”, Felipe comes to Houston with a whole new hour of material and a couple of his friends to round out the show. Seats can be reserved over the phone at 281-481-1188 or on the club’s website: http://www.jokejointcomedyshowcase.com. All seats are $20 payable at the door.